I’m tired. The mornings are no different anymore. I’m tired of the surroundings. My eyes open only late into the afternoon. I struggle to find words to pen down this post. The same words which are so deeply visible on my face, in my mind; just all over my day. Over days, I’ve become a subject to my room. A lifeless subject, sitting motionless on the comforting wooden chair. All day staring at a 14 inch screen, full of life. The same screen which revolves the world and brings it closer by the second. 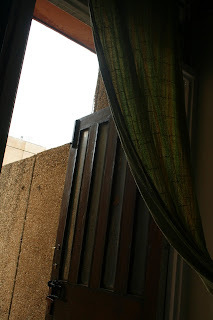 The verandah door to my left, takes my attention every now and then. It’s after months there is a sudden after rain chill in the air. It isn’t humid strangely. The green curtain dancing to its tunes brushes through my face every time there is a wave. The heat it seems had not taken me alone as its victim. The longing for love isn’t visible in me. There is a silence, however. I look up myself in the mirror each day and introspect. The past, present and the future. A lot seems to have changed. Change is good, they say. I wonder! 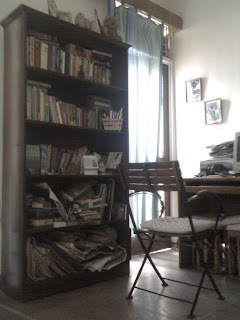 ..And what remains is the chair, my friend in the room. Though I’m still tired... of the darkness, stillness and lonely soul within me. I want to break free from the city into the mountains again. Till then I remain wandering sitting on my chair..
even i can relate to this situation.. They say behind every successful man is a woman. Long back Mario Puzo wrote,"behind every fortune is a crime." Behind every creativity is expression that seeks to fill a void within. Maintain that void and never allow it get filled. Very well written. i know all about it.....the 'wbth' feel........welcome back to hell, when you open your eyes after u are done being asleep. Aditya, one thing is for sure that a person like you may not be physically tired, rather you may be mentally tired or need to have the mental bliss and that too not temporary but for permanent. So that you can work things and still feel mentally fresh and pleased forever!!! YES! FOREVER!!! For that situation to appear, one must know the eternal technique of self-knowledge which gives the eternal bliss and a divine mission to the life. speakin out of ur stillness yet so very turbulent!